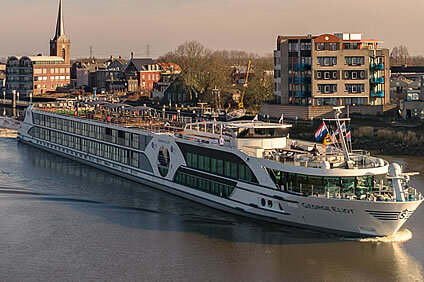 7 Night Cruise sailing from Mainz to Nuremberg aboard George Eliot. You will join your ship in Mainz for the start of your great Bavarian adventure. Be welcomed aboard by the dedicated crew, taking in the air of anticipation and excitement as you explore the luxury surroundings that you will call home for the next 7 days. Settle into your exceptionally well equipped cabin, then get acquainted with your ship and your fellow cruisers while you look forward to a delicious first night dinner to start your cruise off in style. Whether you decide to take breakfast in bed or set yourself up for the day at the plentiful buffet, afterwards you can enjoy a morning exploring bustling Mainz, the capital of Rhineland-Palatinate and an important Roman city for 450 years. Dominating its skyline is the colossal six-towered 12th-century cathedral – Martinsdom – a pinnacle of German Romanesque architecture that houses a spectacular nave, many elaborate tombs and a peaceful colonnaded cloister. Also unmissable is Saint Stephen’s Church, which features nine breathtaking stained glass windows, created by the artist Marc Chagall, that bathe the interior in magical blue light. Book-lovers will appreciate the Gutenberg Museum, located in a gorgeous 17th-century building in Mainz’s Old Town, whose star attractions are two 1455 Gutenberg Bibles, among the first books ever printed. Johannes Gutenburg, the inventor of the movable type printing press, is Mainz’s most famous son, and you can try out his 15th-century book printing technology in the Druckladen, or print shop – a tricky skill to master! Of course, Mainz is also at the heart of Germany’s winelands, so it’s a pleasure to seek out a traditional wine tavern in the pastel-painted, timber-crisscrossed buildings of the Old Town to sample a glass. If you prefer beer, the vaulted chambers of the Eisgrub-Bräu beer hall are a fine place for a mug of the local dark brew. Back on board your floating boutique hotel in the afternoon, find a relaxing seat in the lounge to take in the lovely views of lush woodland and fertile vineyards seamlessly idling by. As evening approaches, why not enjoy an apéritif in the bar before choosing a table in the restaurant to enjoy the chef’s masterful creations for dinner? Awaking refreshed, look out of your cabin window to find a complete change of scenery. We’re moored in Miltenberg, a beautifully preserved medieval village whose labyrinth of winding alleys and lanes begs exploration. Backed by dense emerald-green forest, this picturesque stop-off has something of the feel of a Brothers Grimm fairy tale, complete with a castle nestled into the lush tree-clad hillside. Admire the impressive gatehouse which stands like a proud guardian of the village, and wander across the charming marketplace, lined by traditional fachwerk buildings instantly recognisable by their grids of timber framing. The story goes that locals were allowed free wood from the surrounding forests, hence the abundance of this architectural style. Highlights of this beautiful square include the trickling fountain, ornately carved from stone and complete with dancing cherubs, and the intricately detailed Gasthaus Zum Riesen, which claims to be Germany’s oldest tavern. In the afternoon we pass under Miltenberg’s red-brick bridge and continue to Wertheim, navigating the gentle meandering bends typical of the Main River. Relax and take in the scenery while sipping your choice of tea or coffee or maybe something a little more fortifying from the bar. Or watch the riverside scenes slip by from the comfort of your sumptuous cabin, many of which have French balconies with splendid unhindered views. Wertheim is completely off the main tourist trail, making it a delightful surprise, all the better for its untouched ambience. We pass the fishing boats riding at anchor while admiring the muted colours of the sage-green, pale lilac and buttercup-yellow houses opposite. A russet-walled 12th-century castle overlooks the Old Town, surveying the church spires, turrets and patchwork of multicoloured buildings below. There’s time to explore here and, as you wander the quaint and colourful market square, look out for the blink-and-miss-it Zobelhaus, a contender for the narrowest house in Germany. This evening you’ll be served another delectable dinner, and overnight we cruise to Würzburg. One of the delights of river cruising is indulging in complete relaxation. Catch up on some reading, relax as you watch the world float by or maybe indulge in a little pampering in the sauna and steam room. This afternoon we arrive at elegant Würzburg, which contrasts with the quaint towns and villages you’ve encountered so far. We have a guided tour of this Bavarian city sitting resplendent on the banks of the Main, founded in the 10th century as the centre of the kingdom known as Franconia. The impressive Marienberg Fortress overlooks the neat blocks of grand pastel-coloured buildings punctuated by the spires and domes of the city’s many churches. The jewel in Würzburg’s illustrious crown is the Residenz, a magnificent Baroque palace that whisks you back to a more romantic age. Originally conceived to rival the Palace of Versailles in scale, it is now a UNESCO World Heritage Site, and features one of Germany’s most spectacularly ornate staircases and dozens of interconnecting rooms adorned with gorgeous frescoes, priceless tapestries, sculptures and paintings. There’s ample time to explore here as you wish – the ornamental gardens are enchanting to stroll around – before returning to the ship, enjoying another evening of exceptional cuisine and a drink in the bar as the pianist works his magic at the keyboard. After breakfast we take a drive along the Romantic Road – the perfectly named route made up of a spellbinding procession of folkloric scenery, medieval towns, lofty castles and grand palaces, so picture-perfect they could all serve as film sets. We arrive at gorgeous Rothenburg, crowning a hill with glorious views over the meandering river below. The Old Town is cradled within immaculately preserved walls, and there’s time to explore its narrow cobbled streets lined with tall gabled half-timbered houses. A short drive takes us to Marktbreit, the southernmost point of the Main River and where our ship and another superb lunch await. You’re free to relax on board this afternoon, or you can disembark to explore Marktbreit, a romantic town with elegant buildings recalling the grandeur of days past. Wander the Old Town and admire its Renaissance-style town hall, 16th-century castle and Baroque trading houses before rejoining the cruise this evening. Another day dawns and this morning is free to enjoy the ship’s five-star facilities while admiring the magnificent undulating landscape. The foredeck features exquisite outdoor furnishing and there’s nothing quite as refreshing as the gentle breeze as we progress along the serene waters of the Main. Alternatively, why not find a quiet alfresco seat at the Lido Lounge at the stern of the ship and admire one enchanting vista after another? We moor this afternoon in Bamberg, undoubtedly one of the prettiest small towns in the whole of Europe and so precious that UNESCO declared it a World Heritage Site. Planned by Emperor Heinrich II in the 11th century as a Franconian capital, it sits on seven lush green hills, a similar setting to the city whose grandeur it was meant to equal – Rome! You’ll discover its history and many architectural highlights on our informative tour led by a local guide, which takes in the exquisite Old Town and impressive multi-spired cathedral. Perhaps the most noticeable and intriguing landmark is Bamberg’s Old Town Hall, which sits on an island in the middle of the burbling river, flanked by bridges either side. From here you can also see ‘Little Venice’ – a delightful cluster of former fishermen’s houses built along the waterfront, mostly dating from the Middle Ages. Leaving Bamberg, we join the Main–Danube canal, a superb feat of engineering guiding us to our next fascinating stop, Nuremberg. Of course, this Bavarian city is intriguing for its association with the Second World War, as the site of many pre-war Nazi rallies and, later, the war crimes trials. What’s little known, however, is that Nuremberg also captivates visitors with its cobbled streets with classic half-timbered houses, an enchanting castle (rebuilt after wartime bombings) and many historic landmarks. These include the Church of Saint Lawrence, a stunning example of Gothic architecture, and the intricate Church of Our Lady, which features a working mechanical clock dating from 1506 and overlooks the bustling Hauptmarkt square, itself renowned for its intricate fountain resembling a Gothic church tower. Amid all this splendour, spare a moment to taste Nuremberg’s famous gingerbread, perhaps stocking up with a packet to spice up the biscuit tin back home! Afterwards you return to the ship for your final dinner on board, perhaps selecting a local white from the wine list and, later, enjoying a coffee in the lounge with your travel companions while sharing memories of your exploration of Germany’s medieval heart. After breakfast this morning your friendly crew bid you farewell before you disembark the ship. 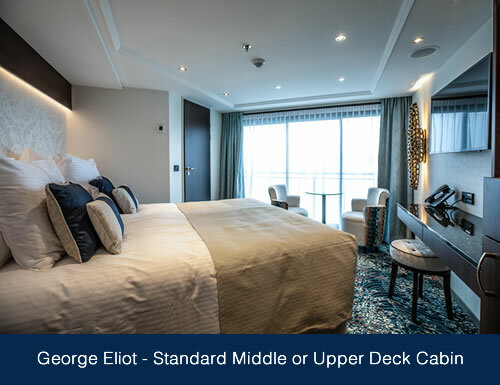 After years of painstaking research to create the most perfect vessels afloat, a new era in river cruising dawns as we introduce our brand new river cruise ship, the Swiss operated and truly world-class five-star MS George Eliot. All cabins provide some of the most luxurious and spacious accommodation you will find on any European river cruiser, with all the elegant and thoughtfully styled facilities of a boutique hotel so your comfort is assured. Beautiful hardwood furniture, stylish premium fittings plus carefully considered lighting and quality fabrics in a cool palette of colours work in harmony to provide the perfect ambience in which to relax. Beds are hotel-style and can be configured as double or twin with the finest cotton linen, and an evening turn-down service. Enjoy a generous seating area with two chairs and wardrobes with ample storage space. Spacious cleverly designed marble bathrooms featuring a shower with fully glazed screen, a WC and washbasin with plenty of space for complimentary cosmetics ensures there’s no compromise to your on-board comfort. Cabins on the Emerald Deck measure 15 square metres (161 square feet) and have smaller fixed windows; some are available for sole occupancy with no supplement (subject to availability). Measuring approximately 16 square metres (172 square feet), these cabins feature full floor-to-ceiling glass doors that slide away to create a French balcony to enjoy the panoramic views. 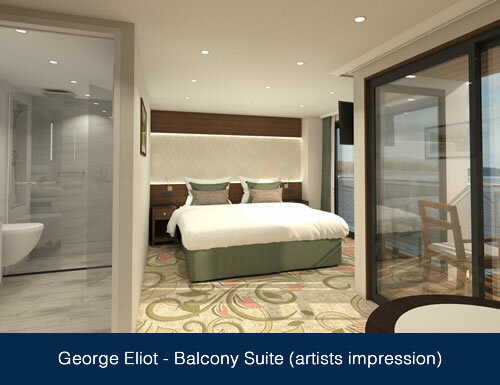 Superior Suites on the Emerald Deck benefit from the larger living area but have smaller fixed windows. Measuring approximately 18 square metres (194 square feet), these Superior Suites benefit from a larger living area plus a French balcony – panoramic floor-to ceiling sliding glass doors. Measuring approximately 23.5 square metres (242 square feet), these Deluxe Balcony Suites allow for a generous living area with chairs and table, plus soft cotton bathrobes and slippers. They feature full floor to ceiling windows plus additional sliding doors which open out on to a small balcony with a table for two.